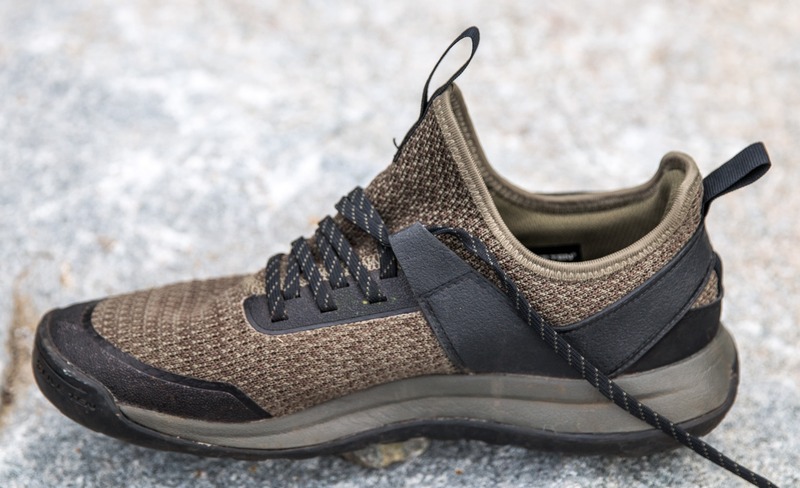 Five-Ten’s new Access Knit approach shoe expands upon their line of “Urban Approach” shoes. Other models currently available include the Access Leather and Access Mesh. The new Access Knit features the same versatility as its predecessors but with a slightly different design which I really like. The “Urban Approach” moniker given the Access Knit really suites the shoes well. 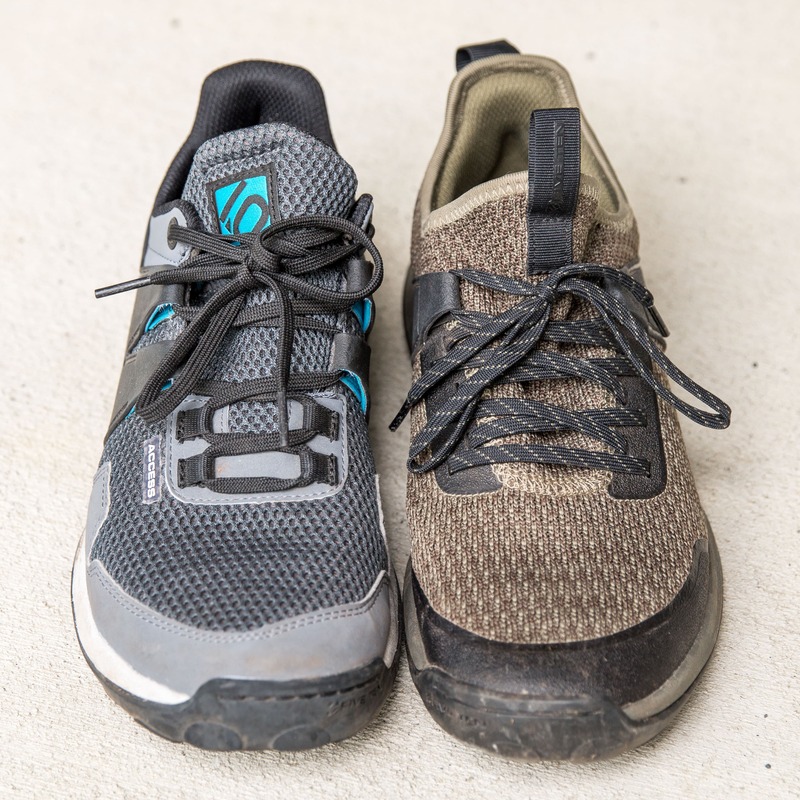 They’re solid technical everyday shoe that’s ideal for anyone with an active lifestyle. The Access Knit (right) and Access Mesh (left). The Access Knit doesn’t have a traditional tongue but rather a continuous layer of woven fabric over the entire foot that’s reinforced in certain areas for support. The knit fabric has some mechanical stretch which makes it easy to put on with the help of tongue and heel pull loops. Once on the flat laces snug up the shoe nicely offering a very secure and comfortable fit without any pressure points. I actually found the Access Knit easier to put on than the more traditionally designed Access Mesh while offering a more secure feel. The sock-like fit of the shoe is incredibly secure and comfortable. The Access line is built on a mid-width last that comfortably fits my mid-width feet. People with narrow, low-volume feet may find the fit a bit loose but it’s great for the rest of us. While the Five Ten site suggests that the fit may be a little small for the size I found it to be bang on. Despite not having a tongue the flat laces allow the shoe to be done up securely without any pressure points. 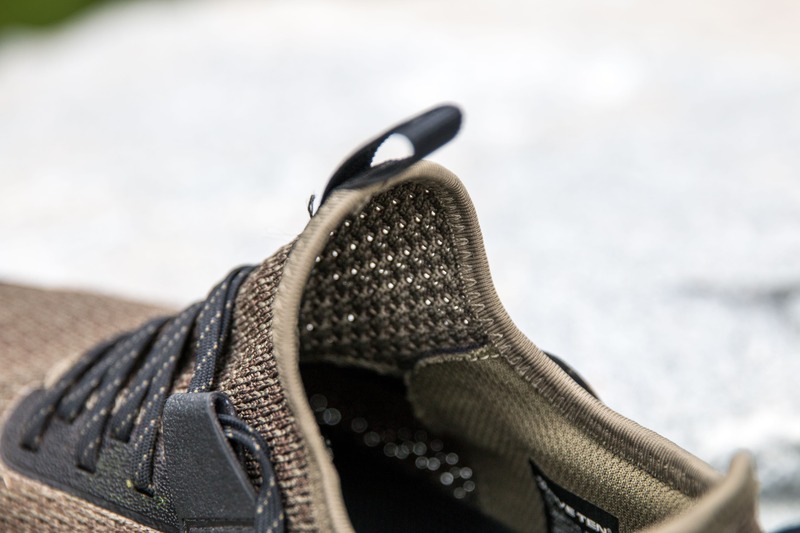 The polyester knit fabric on the upper part of the shoe is very breathable allowing lots of airflow. On the flip side it’s not at all waterproof or dustproof. However, given the nature of the fabric I expect that the shoes would dry out very quickly after getting wet. On the other hand, the permeable fabric would definitely not be ideal in overly dusty or sandy areas. Light can be seen right through the fabric. The coarse weave make the shoes very breathable but not very water or dust proof. 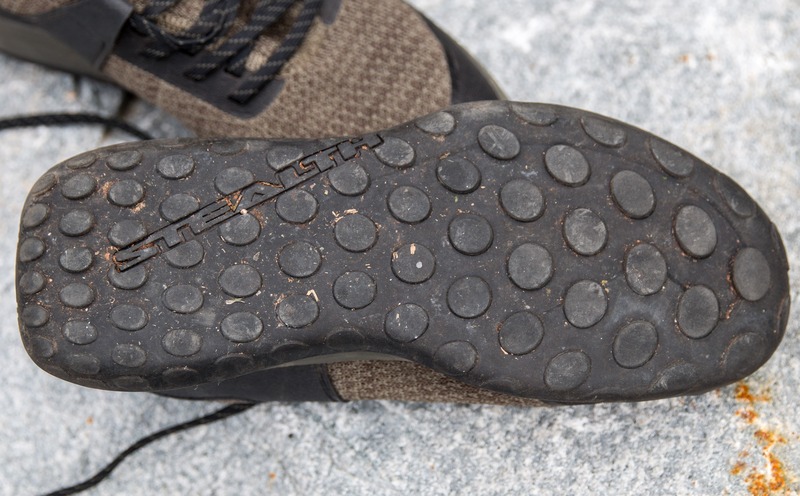 Five Ten used Stealth Ph™ rubber in a dot patterned on the sole of the Access Knit. This very soft but non-marking rubber provides amazing grip on hard surfaces though I suspect that it will be less durable than the harder Stealth S1™ rubber used on the Access Mesh & Leather. The dot patterned sole changes with location on the shoe. Along the edges of the toe sole is thicker and the dots are shallow providing better grip and support when climbing. Deeper lugs at the heel and centre of the toe are designed to provide better traction on soft trails. Instinctively I would have preferred a smooth climbing zone along the toe but I haven’t found any performance issues with the shallow dots. The dot patterned Stealth Ph™ rubber soles have a variable tread depth and pattern for grip in different situations. 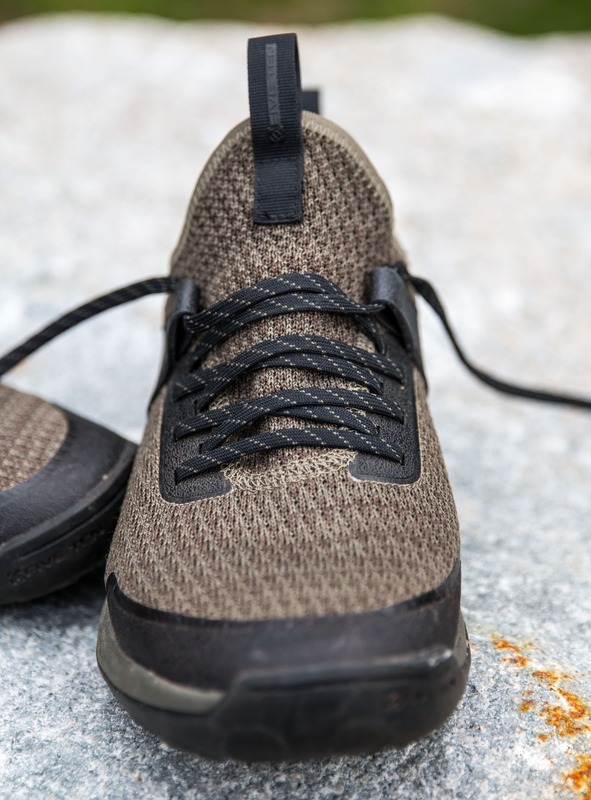 The flexible sole allows the Access Knit to provide a solid grip on slaby rock, gym floors and on the sidewalk. However, the trade-off is that they’re not great on small edges where a stiffer shoe is called for. 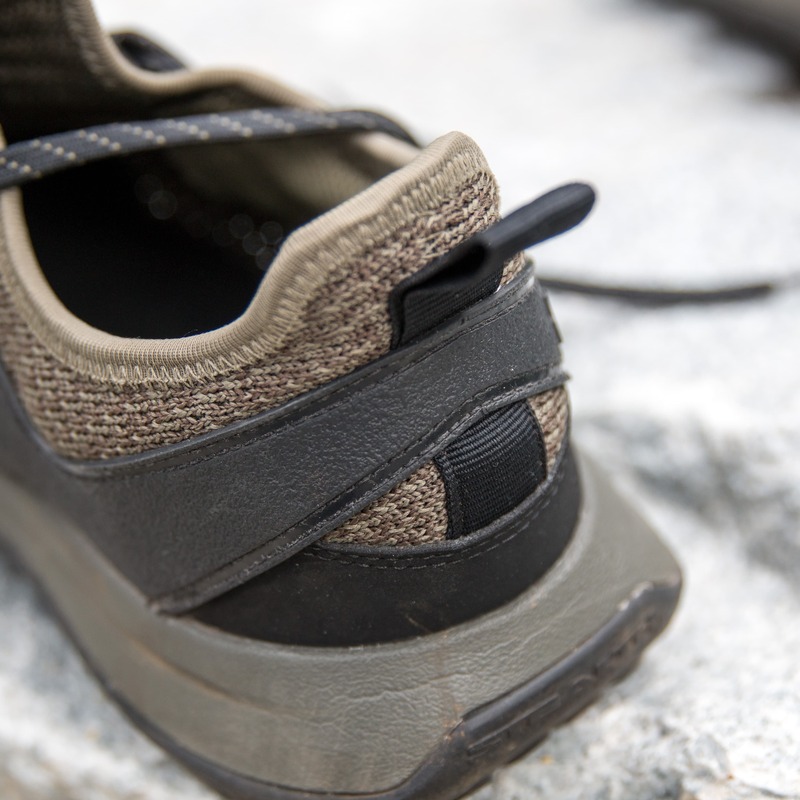 The sturdy heel pull can be used to clip the shoes to a climbing harness. Weight-wise the Access Knit are in the same category as the Arc’teryx Acrux SL or La Sportiva TX3 but a bit heavier than the Evolve Cruzer Psyche or TX2. That means they’re light enough to clip to the back of your harness when climbing though lighter options are available. Looking at the shoes I suspect the thick mid-sole is what adds weight to the shoe thought it increases shock absorption and comfort. 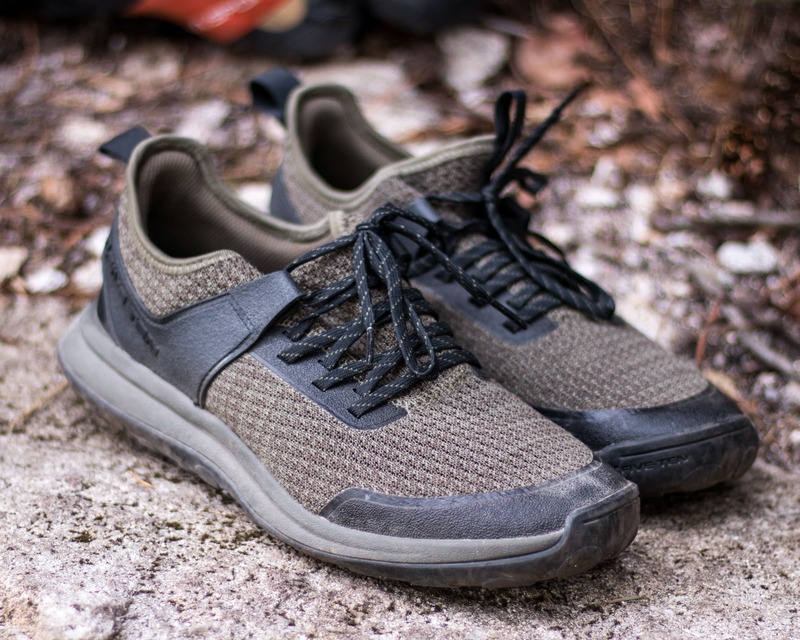 Overall: A fantastic everyday shoe for everything from climbing approaches and scrambling to training at the local gym or just walking around town. Not the right shoe for sandy or dusty areas though. We were provided with a sample of the shoes for testing but of course this didn’t influence the review in any way.